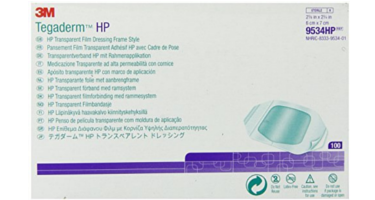 Tegaderm Transparent Dressing HP(Holding Power) is a frame style, sterile, waterproof, clear, thin film dressing. Special adhesive provides greater holding power under moist skin conditions. This transparent dressing can be applied over I.V. devices, clean skin or wounds, and provides a breathable bacterial barrier to outside contaminants.